As mentioned in a previous post the Osprey rules, The Men Who Would Be Kings, are an excellent contender for gaming this period. These rules are more toward the ‘hollywood’ end of the spectrum and in that regard suit our gaming purposes well. In this post we’ll discuss ideas related to TMWWBK. Dan Mersey’s rules have been well reviewed by colonial gamers so I won’t go into any details on that. You can check out TMWWBK reviews with a simple google search. This is a good one to give you an overview of what it’s about and a video review here. Downloadable rosters are available here. The relatively broad troop profiles in these rules allows for an easy translation of aboriginal warriors into the game with some minor period specific tweaks. This section provides details on troop profiles, scenarios and ‘sub periods’ to model your forces on. There is naturally a good deal of cross over though there are regional and time related differences that go to make the Frontier Wars using TMWWBKs one of an evolving European force against a relatively same type native force. This was a feature of the war and the rules show how the evolving technologies impact on the effectiveness of the forces involved. The troop profiles give most, but not all, of the likely characteristics of the forces engaged in the Frontier Wars. Broad guidelines are given but invariably there are always exceptions to the rule. With TMWWBK representing a virtual 1:1 figure scale game for Frontier Wars games, much variation is possible. Players therefore should use the profiles as ‘go to’ guidelines but not be strictly bound by them, following the suggestions in the ‘Building a Field Force’ section of the rules. The monolithic nature of Aboriginal tribal warfare dictates that they be treated as a broad class of Tribal Infantry in TMWWBK. These troops cost 3 points per unit. Most Aboriginal warriors relied on ‘massed throwing’ of their long range spears before closing to contact, this being reflected by them using the Woomera, though not all tribes used them. As a guide, aboriginal tribes of Tasmania, south and central Queensland and the Tiwi in the Northern Territory may not be woomera armed. Some tribes used an ‘enhanced’ woomera to increase firing range, the so called Goose-Neck woomera, but like other woomeras, it was not widely used – so it may only be used by Aboriginal tribes of north-west Northern Territory and the far eastern Kimberley region. Typically Aboriginal tribesmen were wary of firearm opponents, ‘gun shy’, and so they are given the Gooroobeera rule below. The ferocity of some tribes over others and their tendency toward close combat vs prolonged long range fire tactics means there is no hard and fast rule as to how tribes should be portrayed – individual tribes developed their own way of fighting the white man. Therefore, in addition to the usual tribal infantry attributes in TMWWBK, aboriginal warriors (using the guidelines above) may be armed with woomeras. This weapon in many respects puts them on a parity with antiquated smoothbore musket armed colonial forces, though the reduced firing number we use (6) reflects their relative lack of lethality. Against more modern firearms they were outclassed. The huge number of aboriginal clans, their motivations and commitment to their ‘fight’ at various times of confrontation with colonial forces means there can be no definitive classification. Therefore, all aboriginal foot may variously be given an unenthusiastic or veteran rating depending on how you wish to portray them. Aboriginals may also be taken as musket armed. Their use was limited so only taking a single small unit seems appropriate unless depicting a specific clan, perhaps Jackie-Jackie’s clan on the outskirts of Melbourne, who had more firearms than usual. Treat them as Irregular Infantry, with the fieldcraft and poorly armed trait. The option to take them as sharpshooters is allowed to reflect aboriginals who are well acquainted with firearms and were generally regarded as good shots. Due to the limited availability of firearms using a ‘1/2 sized’ unit for a cost of 2 points is recommended. Woomera: Range 12″ with a Firing number of 6 @ +1 point per two units. Alternatively, four units may be equipped for 1 point, but each unit rolls 1 dice per two figures. These troops represent those small numbers of groups who did use firearms, such as Jandamarra’s rebellion in Western Australia. It is hard to say, or know, how prevalent firearm usage was but it did occur so perhaps wider use may have occurred – no one can say. We will use the irregular infantry profile plus the Fieldcraft trait as standard, at 5 points per unit as a ‘base line’ troop profile. Veteran: any number of units. Sharpshooters: 0-1 units can be Sharpshooters, which also needs to have the well armed option after 1870. Gooroobeera (Stick of Fire): Aboriginals developed a healthy respect, and counter tactic, against firearm equipped opponents. Therefore, all Aboriginal units that wish to attack a unit armed with firearms must pass an activation test, and those taking a pinning test from fire suffer a -1drm. However, when receiving any hits from muzzleloading small arms fire roll a d6 for each hit, negating the hit on a score of 5+. If any hits are negated they are now counted as ‘gone to ground’ (this reflecting their tactic of falling to ground in response to being shot at). Cannon Fire: apply a -1drm to any Pin test caused by cannon fire. Leaderless unit: troops may use the ‘taking command of leaderless troops’ rule. Terrain Morale boost: Add +1 to any Rally test if a unit counts as in cover. Clever Man: Aboriginal people believed in the effects of magic and sorcery. Keepers of this knowledge were called ‘clever men’ (amongst other names). They variously healed and punished by their chants and incantations. Musketry training was virtually non existent for many units; this lack of fire proficiency combined with the often reported high rate of misfires, means that it would be not uncommon to rate troops as poor shots in TMWWBK. The increased lethality of the musket over tribal weapons however is reflected in the better fire rating that will to an extent be curbed if classing troops as poor shots – this combination of ‘obsolete rifles’ and ‘poor shots’ would reflect early untrained troops with smoothbore muskets up to the 1830s. Note, regular troops typically fought in ‘open order’ in the Frontier Wars so the use of the TMWWBK skirmish order is particularly appropriate in this conflict. Similarly, the use of open order in this early period suits the standard way Regular Infantry is portrayed in TMWWBK, so no distinction is made between regular and light Infantry, though grenadiers are rated as fierce. One could make the case that untrained troops that are rated as poor shots should not be allowed to use the Close Order/Volley Fire actions – I shall leave that decision for players to decide but it is not unreasonable given the lack of training of close order field drill and the otherwise standard practice of open order tactical deployment of troops in the field. Whites of their eyes! : the British player may opt to use this rule for his Regular Infantry. *Note – players may experiment with the idea of allowing antiquated musket equipped troops to be given Obsolete Rifles as a weapon – though they would in reality still be equipped with smoothbore muskets. This we feel improves the firearm weapon to woomera/spear range interplay better and is appropriate for the period, even though the troops are equipped with smoothbore weapons. If both players agree, then allow British infantry to be so equipped. These troops represent the bulk of the local colonial forces raised during the Frontier Wars. No Australian militia units were formed for frontier service. It includes convicts and settlers of all types. We will use the irregular infantry profile at 4 points per unit as a ‘base line’ troop profile. Veteran: any number of units (though probably not settlers). Poor Shots: represent both their lack of training and the use of obsolete weapons; any number of units. Fieldcraft: any number of units. Unenthusiastic: reflects their lack of training and/or ‘fear’ of Aboriginal warriors; any number of units. The Native Police were for all intents and purposes a military force, albeit an irregular one. Their role was to seek out and engage the aboriginal clans/bands beyond the frontier, rather than administer ‘the law’ as one would expect from a police force. Of all the Native Police the Queensland division were particularly feared by aboriginal peoples because of their ruthlessness. We use the irregular infantry profile equipped with obsolete carbines at 3 points per unit. Native Police could enter an engagement either mounted or dismounted so we allow the option for any unit to be taken as either Irregular Infantry, who can then be taken as Mounted Infantry. Artillery was seldom used during the Frontier Wars, though it was available. It is included here so it may be used for hypothetical actions. Aboriginal warriors would most likely encounter such weapons if they were attacking a camp, or such; it would be highly unlikely artillery would be used in any ‘running battle’. They fit with the description of the crewed weapons profile, which we will represent as a well drilled, field gun. ‘Swivel Guns’ on the other hand were occasionally deployed in the defence of homesteads, themselves a form of block-house in construction. Therefore, they are treated as a poorly drilled crewed weapon, machine gun. They jam just like machine guns reflecting low ammunition quantities and inefficient usage of the weapon and may have a maximum of three crew only. Note – from the instances where Aboriginal warriors engaged colonial forces equipped with swivel guns it appears they were quite fearful of the cannon fire so apply a -1drm to any Pin test that they take. Climate: In any scenario where the Aboriginal player is the attacker, he may ‘enforce’ the climate rules to be used. Roll a D6. On a 4+ the battle takes place in the climatic conditions beneficial to the aboriginal player’s side – usually stinking hot weather! Roll a d6 to see the effect: on a 4-6 all units suffer a -1 to their discipline roll, on a 2-3 all units suffer a -1 to their leadership roll, and on 1 suffer -1 to both! The following optional rules add further period specific elements to the game – use some, none or all as you choose. Skirmish Kings: The half sized unit game is recommended to represent the many small clashes that occurred – these were common place so smaller unit representation is entirely appropriate and delivers force sizes at a 1:1 scale of approximately 30-40 figures for British forces and 50-60 figures for aboriginal forces. These are good troop size representations for Frontier Wars engagements. If desired off course, full scale games can be played also as actions of that size which most definitely did occur, but less frequently. Leader, once activated, may move as per their type or ‘hand off’ a free action to any unit that is within one move distance. This ‘hand off’ does not account as an action by the unit that receives this ‘order’. Tracker: Negates opponent’s ‘more tribal units’ tactical value modifier when determining attacker in a scenario. Before game start, the British player may move D3 terrain pieces 2D6″ (reflecting better intelligence of likely enemy locations) for a cost of 1 point. Barricades: 8″ of barricades may be taken, counting as hard cover from all small arms fire, and soft cover from artillery fire, for a cost of 1 point. The Buildings count as hard cover and obstacles, and each may by occupied by one Infantry unit. Each building has 15 Structure Points. It may not be assaulted by any foot troops but may be destroyed by artillery fire. It has firing slits all round. Field guns (but not machine guns) may shoot from distance (the buildings do not count as in cover and always count as being at short range if in range). All successful hits reduce the building’s Structure Points. If a building is reduced to 0 Structure Points or less, the building is removed from play and replaced with soft cover rubble. Any unit that was inside the building counts as destroyed. Split Fire: British and Colonial forces were often heavily outnumbered. Therefore the ability to fire on multiple units should be allowed but at the reduce chance of inflicting pins or damage. Therefore, a British or Colonial unit may split its fire to target any number of enemy units. Each time it does however it costs 1 shooting dice in each new group to reflect the confusion of multiple targeting eg a 12 figures unit that fired at two targets would shoot with 5 dice each (ie two groups of 6-1=5. It could fire at three targets with 4-1=3 dice each, and so on). 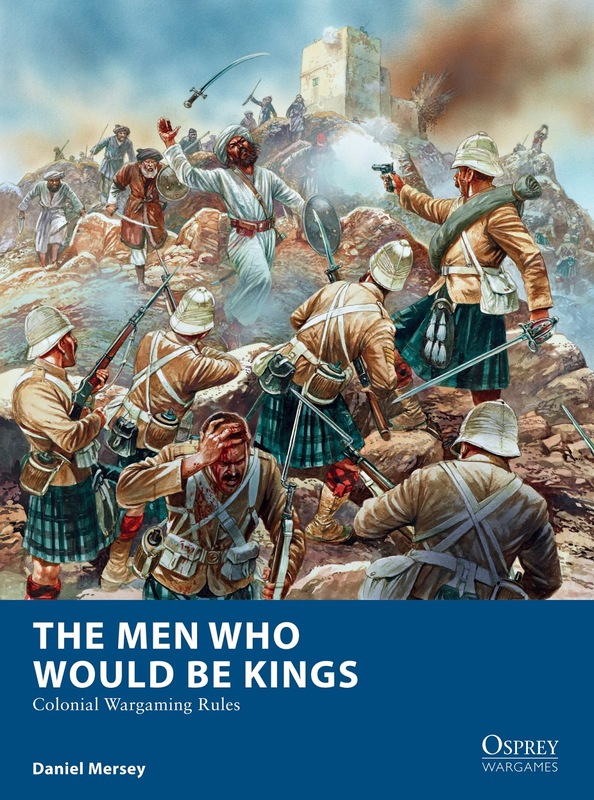 Historical Note – aboriginal tactics often revolved around multiple lines of attack to surround and overwhelm an enemy, rather than desperate frontal assaults ala Zulu and Mahdist hordes charging into the fray. In TMWWBK the requirement that a unit only fire at one target kind off encourages this multiple lines of attack approach by the aboriginal player. Therefore by design, a surrounding ‘crescent attack’ is to the aboriginal player’s advantage even though the rules do not specifically call for it – be so advised!. The Split Fire rule to some degree lessens this in game effect but is still worth including in your games as the effect of reduced firepower against multiple attackers strikes a nice balance between small unit capability and multiple flanking attacks having some value in the game. Both played must agree before using this rule. Rally with Elan: any unit that passes a rally test by 3 or more than the required score, may take an activation action eg a native unit with leadership 7+ that scores 10, 11 or 12 on its rally test could conduct its free move action or another activation by passing its activation die roll as usual. All scenarios in TMWWBK are commonplace Frontier Wars types of engagements, with perhaps scenario A being the least likely…all the rest are typical!! The scenarios can portray either side in the attacker or defender role, though typical encounters are shown in the following list. If you wish, give the defender in the following lists +1 to the Tactical Value dice roll. Seek & Destroy: Colonial forces should be the defenders. To the last bullet: Both sides can be attackers. Get off my Land: Colonial forces should be the defenders. Run to the Hills! : Aboriginal forces should be the defenders. It’s awfully quiet out there… : Colonial forces should be the defenders. A sight of relief: Both sides can be attackers. SCENARIO I: Burn & Loot: a very common tactic by aboriginal warriors was to destroy the viability of farms established on their traditional lands. This was usually done by burning settler crops or killing or hamstringing their livestock. Sometimes the livestock was ‘stolen’ and taken back to support the warrior’s tribe – a type of ‘economic guerrilla warfare’. Sometimes this type of raiding was combined with an attack on the homestead building as well to ransack and terrorise the settlers to ‘drive them away’, or worse. To limit reprisal attacks against the raiding force, it was not uncommon to limit loss on the defending settlers, thus maximising economic harm through the destruction of livestock or crops and limiting potential attacks against the raiding force itself. The following scenario represents this type of attack. This scenario should place a Settler force as the defenders. Both sides chose 24-point Field Forces. The game is played ‘up the table’ ie from short edge to short edge. The table is divided into 6 equal areas (generally 2′ squares). The defending player places 1 building in the centre of either two squares at his short table end. Low walls and village scatter may also be added in this area (mostly for soft cover), but avoid any ‘fortified’ sites. He then places objectives (sheep, cattle, corn) in each area. The defender deploys up to 12 points on the table, at least half of which must be in the two centre squares. The remainder of his units come into play when he activates them from off-table – apply a -2 drm to these activation attempts. These activation attempts can only be made in the turn following one in which the on-table defenders have fired a weapon at the attackers. A successful activation enables him to place 1 model from the unit touching the baseline on his base edge. The attacker deploys along the opposite short table edge to the defender’s building, with 1 model from each unit the touching baseline. He must exit of the same table edge to gain victory points. n/a in this scenario – the settler forces are always the defender. The attacker is activated first in every turn. The Building counts as hard cover and obstacles, and may by occupied by two Infantry units. Aboriginal warriors cannot destroy the building. The attacking player gains victory points for moving into an area and ‘raiding’. He does this by successfully activating in a turn and then rolling dice as for a normal combat, with a hit being scored on 3+. He must get 6 hits to successfully ‘raid’ that area. He may spend multiple turns doing so to achieve his task. If he wishes to ‘raid’ (loot) he must remove D3 figures from his unit and move them at 6″ per turn toward his base edge to remove the captured booty – this will be worth more victory points to him. Victory points are also gained if settler losses are less than the number of areas ‘raided’ eg four areas are raided and only 3 or less settlers have been killed. The attacker may choose to retire units from the table — moving one model off allows the whole unit to retire. Such units do not count as casualties—this is the way a raiding force inflicts damage quickly and then withdraws to minimise losses by a settler counter attack, usually by foot or mounted firearm infantry. The game ends after 12 turns or sooner if only one Field Force remains in play. +2 for each attacking unit routed or wiped out. +2 for each building remaining intact at end of game (unless the defender is no longer on table). +2 if less settlers are killed than areas raided. +1 for each unit moved off short table edge he entered from. The period covered is vast as we have discussed in the previous posts. We can however define ‘sub periods’ or ‘areas of operations’ as we have already done. Using this as a guide we shall put forward some ideas for the forces involved. The example forces give you some indication of possible force make up, they are certainly not the only ones. The typical mix will be a selection of aboriginal warriors, with various options from the tribal infantry list and the the colonial forces will be made up of army, police and settler forces. As I say, they in no way reflect all options or the choices or upgrades each troop type may also have. The lists are as close to 24pts as possible and I suggest that when putting forces together you allow a 1 point leeway (ie 24 or 25 point) to enable force construction to be a bit more flexible – it won’t make much difference during play. Each force is presented to give a feel for the respective forces in each area of operations and to show the changing face of the force mix and weapon technology. Note – playing this introductory game using scenario A would be a good starting point when learning TMWWBK and an appropriate ‘first game’ of Frontier Wars. Note – players may experiment with the idea of allowing antiquated musket equipped troops to be given Obsolete Rifles as a weapon – though they would in reality still be equipped with smoothbore muskets. This we feel improves the firearm weapon to woomera/spear range interplay better and is appropriate for the period, even though the troops are equipped with smoothbore weapons. If both players agree, then allow British infantry to be so equipped for an additional +1 point per unit. I terms of the various Mounted Police units are there any good books or websites you can recommend. I’d be interested to know more about them as well. I must say that your posts on the AFW have really opened up a multitude of gaming possibilities on what must surely be one of the least known colonial conflicts. If you ever feel the urge to do a similar treatment on our other great Antipodean conflict ‘The New Zealand Wars’ let me know. I’d be more than happy to help out.